Hari OM! Namah Shivaya. Om Namo Narayanaya! It is common for us to celebrate birthdays as our special day. Our friends and family come together and shower us with attention and love. Taking the spirit of this concept forward, let us create a difference by celebrating the birthday of a book – Bhagavad Gita – from now on. Bhagavad Gita, which was revealed to Arjuna by Sri Krishna Himself in the battlefield of Kurukshetra (in present-day Haryana state, 200 km west of New Delhi) on the Shukla Paksha Ekadashi, the 11th day of waxing moon of Margashirsha month (Dhanu) of the Hindu calendar. This conversation was heard by Sanjaya, who had been blessed by Veda Vyasa, with the power to remotely view (Jnana Chakshu) the events taking place on the battlefield as it happened. Sanjaya narrated this conversation to the blind King Dhritarashtra on the 10th day of the Mahabharata war which is when the world knew about it. This year’s Gita Jayanthi falls on 18th of December. On the occasion of ‘Gita Jayanthi’ let us all come together and spread the awareness of ‘Gita for Life’ by being a part of ‘#GitaChallenge’ and participate in this with a spirit of spreading the happiness beyond the boundaries by widening the knowledge about Bhagavad Gita. How to participate in #GitaChallenge? Participation in this challenge is open to all; young kids to elders all across the globe are welcome. Challenge Type1. Pick up any one sloka of your liking from the 700 slokas across 18 chapters of Gita. Chant the sloka and say its meaning. Challenge Type2. Along with the chanting of the sloka and its meaning, if you can share your experience of how that particular sloka has helped/ guided/ transformed you in your life, by narrating the actual situation or problem. It should not be more than 3 minutes. Challenge Type3. There are many people who may not have social media accounts but have been practising Gita in their lives. You can request them to chant and share their experience and record them in their work place background to upload with #GitaChallenge hashtag. You may be surprised to find such people very near to you (such as paan-waala, cycle-waala, tea shops vendors, or may-be your own grandmother or grandfather). Challenge Type4. 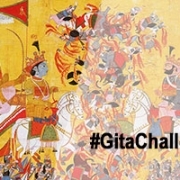 If you would like to create any artwork related to Gita you may also post it with #GitaChallenge. You may also post Gita sloka with its meaning and how it has made an impact on your life. This challenge can be accepted by uploading your content in Video format and post it on social media –like Facebook, Twitter, Instagram, YouTube etc. – with the hashtag # GitaChallenge. You can tag your friends and ask them to take up the challenge. They can be of any age, from any country and in any language. You also can talk to your school/college authorities, culture departments etc. and request them to help take up the challenge. 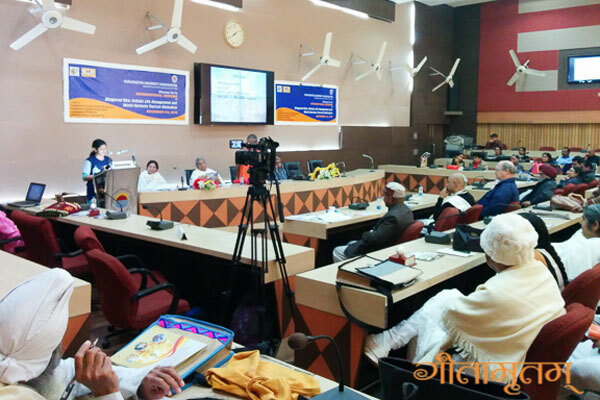 The intention behind this challenge is to bring out the relevance of Bhagavad Gita in our daily life where we can connect the slokas to specific instances in our personal, professional or social life. On this special day (Gita Jayanthi) let us remember and cherish this great scripture containing the secret solutions to the ultimate goal of our lives – Happiness. Let us appreciate the beauty of this scripture for being beyond time and space; one can embrace it. Gita has transformed many lives over the ages. Let the ones who were transformed, share with the world, how it can transform anyone. 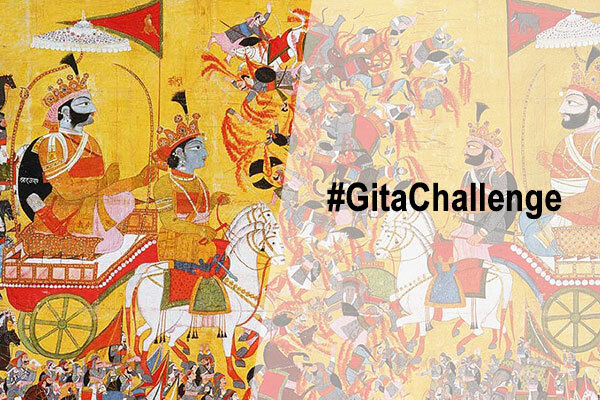 You can take up the #GitaChallenge right away and prepare the videos and post it. Retweet it or share again the submissions from16-17 dec once again since 18th of December is Gita Jayanthi day. Let us not miss this opportunity in challenging people who love, learn and live Gita in their day-to-day life. Watch some interesting videos from our students. 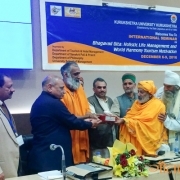 The Government of Haryana invited graduates of MAM’s Gitamritam Bhagavad Gita Camp to participate in the International Gita Seminar conducted at Kurukshetra University. Kurukshetra is in Haryana, where the Bhagavad Gita was told to Arjuna by Sri Krishna about 5,000 years ago. It is just a 3-hour drive from New Delhi. 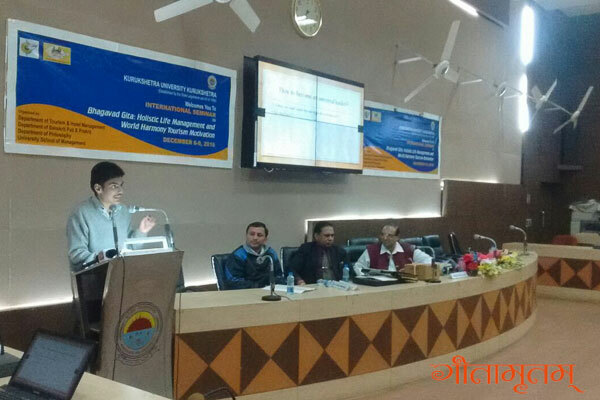 The program was held at Kurukshetra University from 6-10 December at Kurukshetra, Haryana. 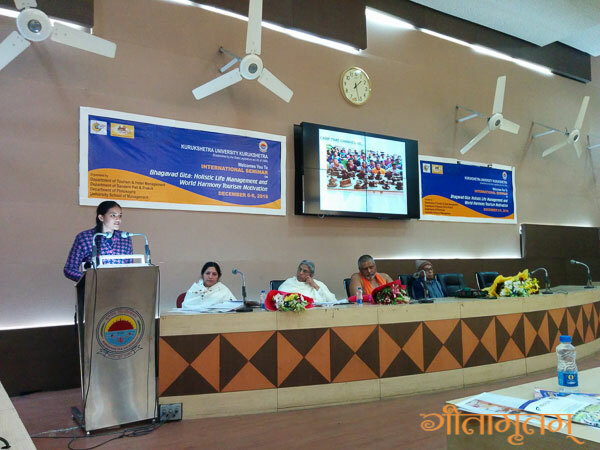 It was part of the Gita Jayanthi celebrations conducted by the Government from 1st to 11th of Dec.
Nine of the students from Gitamritam were presented papers on various topics related to the Bhagavad Gita at the seminar. 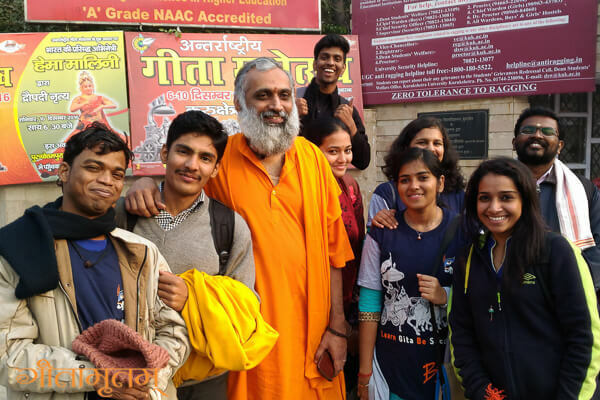 The last four students are from Gitamritam Camp for Bala – three are in their +1 class. 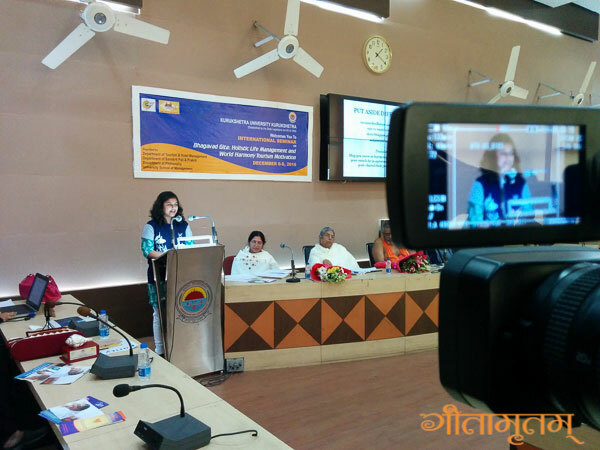 The panels consisted of Scholars, PhDs, PhD students and even Padmasree awardees. There were more than 250 delegates in the hall, both national and international. 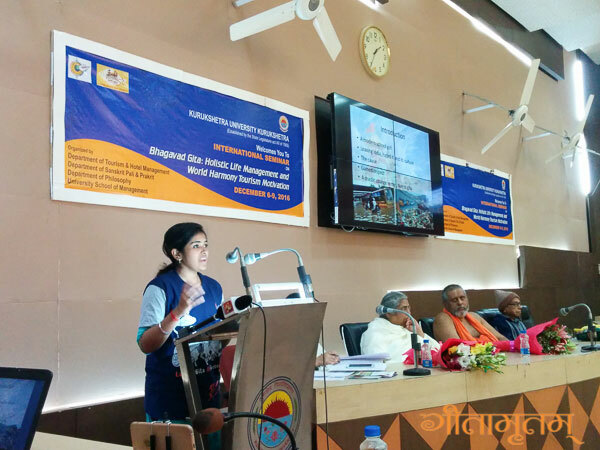 The delegates expressed great enthusiasm for the presentations given by the young Gitamritam graduates. Several commented, “These kids should have been given more time.” One of the panel chairs invited one of the Gitamritam students to be a part of the panel for next year’s conference. 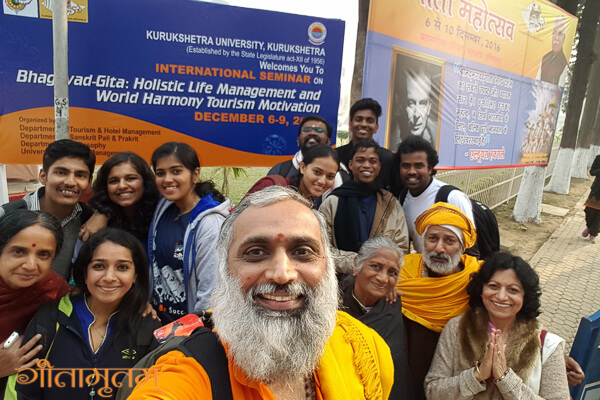 All the Gitamritam graduates thoroughly enjoyed the experience, gaining at least as much they gave. On the first day of the conference, all the paper presentations were in Sanskrit. 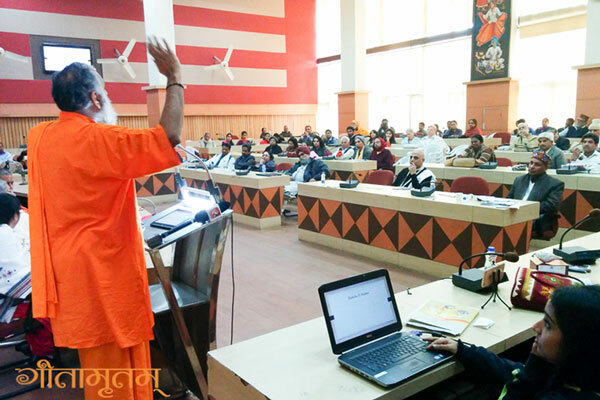 After listening to the Sanskrit presentations at the seminar, Rishika (who presented a paper on Dharma consciousness for universal peace and harmony), even though she didn’t understand a single word, was inspired to learn Sanskrit. It was the first time she heard a Sanskrit conversation, and she was overwhelmed by the beauty of it. After a round of speeches by dignitaries gracing the event, Br. 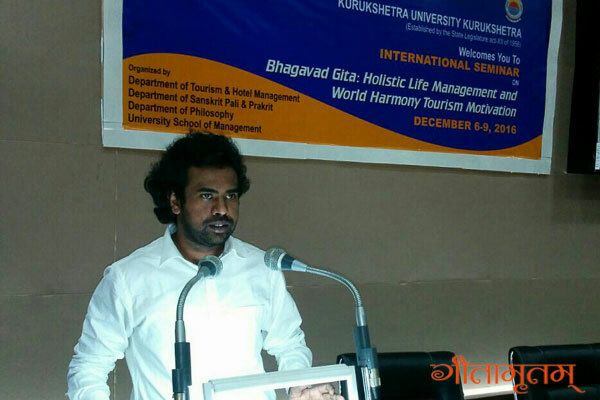 Dhyanamrita Chaitanya was invited to share a few words. He spoke about Amma as a Sthitaprajna, and shared his experience of the way Amma lives the Bhagavad Gita in every moment of her life. Suddenly a silence fell over the crowd, many had goosebumps when they learned that that there is a saint who is living the Gita here and now. “Amma’s disciple’s words had a special power – though each of the scholars who spoke before him was well versed in Sri Krishna’s message as conveyed through the Gita, Dhyanamrita has lived with Sri Krishna himself, embodied in the form of Amma. 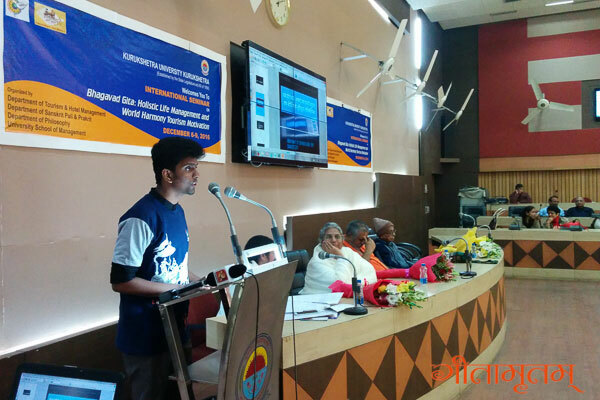 His experience brought a sweetness and magic to his words that mere theoretical knowledge could never match” said Kavin Prasad, one of the participant of the Seminar. Thanks to Gita. I have changed from being selfish to being selfless. But at instants, situations ask me to act angry, even though I am not. Gita has taught me, how to overcome anger and how to be detached from this materialistic world, in order to attain God. It has taught me to accept people as they are and that I shouldn’t expect things from others. I even judged people many times, which is a wrong act. The values that I have tried sharing with you through this story, makes not even 10% of what Gita wants to convey. There are loads of things that the instruction manual of being happy coveys to this world. In fact, it is almost as if I am Arjuna, and Gita is Krishna who transforms me. Marriage and family are indispensable ingredients of a thriving society. Yet today, many are questioning its relevance and necessity. With the increasing rates of unhappy marriages and dysfunctional families, this paper proposes that the Bhagavad Gita be used as an aid to address and resolve some of the issues our culture today faces. The Gita is the eternal message of spiritual wisdom and has received global recognition on its timeless relevance. 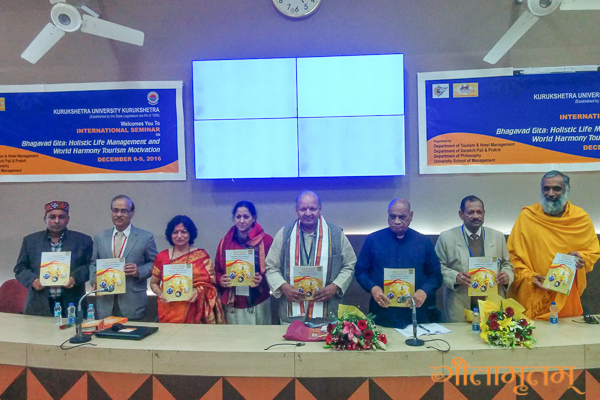 With references to various verses from the Gita, the paper explains a few of the many applications of Gita and how it can ameliorate the family dynamics. Simple concepts presented under the light of Gita, such as the art of give and take, seeing divinity in everything, the practice of spiritual values in family life and attachment with detachment are discussed. This paper suggests that marrying the teachings of the Gita into a family life will ensure a life of love, peace and joy. The real centre is the Universal Centre which is the key to our happiness. A real leader is a person who face the situation and does not run away from the situation. The facing situation will happen only when the person is centred in the Universal Centre. People like Arjuna are intelligent and talented but are not capable to manage the situation when crisis come because such people are deciding based on the Anithya or the Changing. Krishna on the other hand is balanced and still because he decides based on the unchanging or Nithya by seeing the situation for a larger good or good of the universe (Universal Centre). If a person is sheltered in their real nature only then they can be balanced in any situation and only such person can handle any situation may be time management, crisis management, conflict management. The idea of how to remain in the centre, the behaviour of the people who are not in their centre and people in the universal centre is depicted in this article. Fortification constructed of self-control and universal love makes the mind impregnable to the foe. A fortified city is free from the danger of being attacked by the enemy. Man’s mind has to be similarly fortified against the invisible enemies. Lust, greed, anger and hatred are the enemies wrecking the career of man. They are capable of invasion at any time. When the mind falls into their hands, man is ruined. It has to be therefore properly fortified. When the defenses are strong the enemy beats a retreat. It is by the performance of dharma that the fulfilment of life takes place. The dharma of man is to exert his best for common good. Values of Gita is like a flowing river. It reveals: truth over untruth, justice over injustice, dharma over adharma. What makes this conversation that took place ages ago, so relevant to us – people living in 21st century? We often get stuck in similar kind of anguish, in our daily lives. The answer to those predicaments lie in understanding the nature of a devotee which is of paramount significance, rather than just being one. Majority of people would take pride in pledging their devotion and exhibiting it by fulfilling rituals with heart, whole or half. It is interesting to see how when asked what should be done, Lord explains what should be strived for, in the twelfth chapter, what he is fond of particularly. It could baffle you since Lord continued to emphasise on importance of attitude than action throughout. My paper shall explore this domain, of nature and misconceptions of devotee – trying to understand what it means to be one. One of the most critical aspect of management is the self management with respect to one’s schedule, plan and more importantly control of one’s mind. 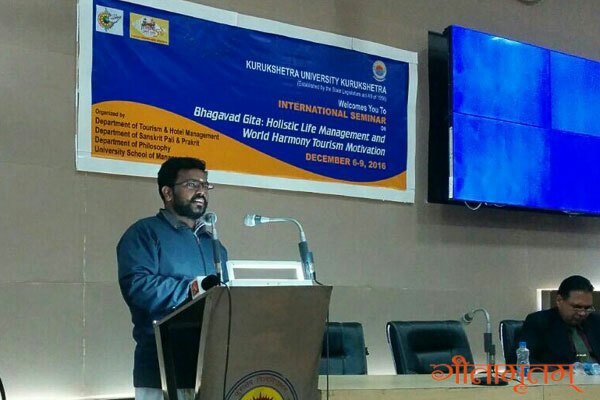 How does Bhagavad Gita offer solutions to such aspects of the modern day management. The need for peace and harmony appears to be more of a necessity now than ever before as these problems can only be solved if the world stands together as one and the countries work in cooperation with each other for the benefit of all. Why has this not happened yet? The reason for this is that in today’s world, there seem to be many Duryodhanas and Krishnaless Arjunas who are lost and aren’t aware of their dharma. The Duryodhanas include the corrupt politician, the terrorist killing innocent ones, the fraud businessman, the womaniser and down the lane, they also include the seemingly harmless student littering the streets. The Krishnaless Arjunas are the people who sit back in their chairs and comment/critic the actions of the people around them and share their dissatisfaction on social media (with Facebook being the one most commonly used) instead of taking action themselves. All these wrong actions originate from expectations, the feeling of incompletion and the absence of peace in the minds of the people. With Krishna not being there to bring an end to the corruption and guide them down the right path, the Bhagavad Gita is what will help them grow conscious of their duties (dharma) and responsibilities. Our each day begins with a conflict, the conflict of choices. Throughout the day we face this conflict. Every moment demands us to choose out of the many options available. And it is that dilemma of doing it or not and doing what which keeps us in whirlpool of confusions. The availability of options ranges from getting up at the first call of alarm or not, choosing coffee or tea to declaring surgical strike against any nation or not as a defence minister, or even the latest decision on demonetization by the Centre. The conflict of choices goes on and on and then there comes a moment to act. And it is that defining moment demanding immediate action which forces us to decide. It is henceforth that particular act of decision making which is actually responsible to give new dimensions to life and to pave new ways for us. The development as we see around us today is nothing but the result of decisions taken long back. The civilized societies and technological advancements are all results of better choices. Similarly, pollution and corruption too are results of the wrong decisions taken by us. These decisions can be changed. If love, compassion, sacrifice, selflessness still exist in this world that too is because of some people’s decision to retain them in this ever changing world. All of us were able to smile at everyone out of joy, all around the globe, at the animate and in-animate, with out any differences…when we were all babies. And we loose that blessing as we grow. What have we lost, where have we lost, how we have lost that smile? Bhagavad Gita gives you the key to answer this as learning Gita is to become Krishna himself. Sri Krishna is smiling under any circumstances as he is always aware living in the present. If you want to be happy, be happy right now as happiness is always in the present. Let all your actions not be for happiness and let it come out of happiness. Instead of becoming happy, be happy. Now or never. M Chaudhari: It was a new insight, I found the an answer to the question I was searching for. S Shulka: Every one was copy pasting from ten books make another one to present here. Yours were original. Dinesh: Your style of teaching is very good. Children at this age can speak liked this!! P Sharma: These students have taught in a very special way. Its clear that they have understood it. 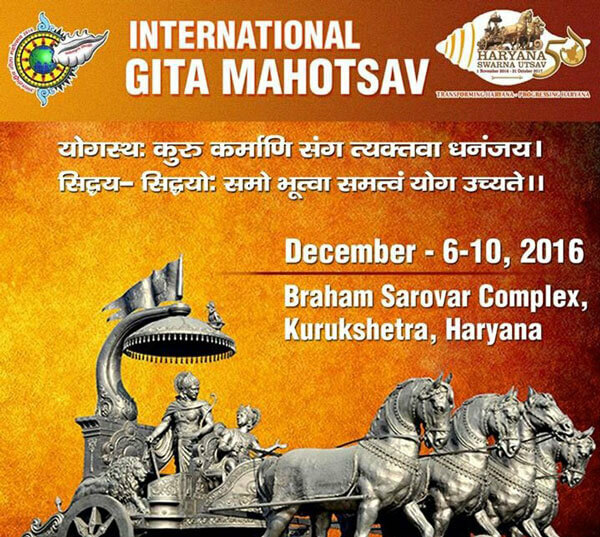 The State Government of Haryana has invited Gitamritam to participate in a Mahotsava being held at Kurushetra in connection with Gita Jayanthi 2016. 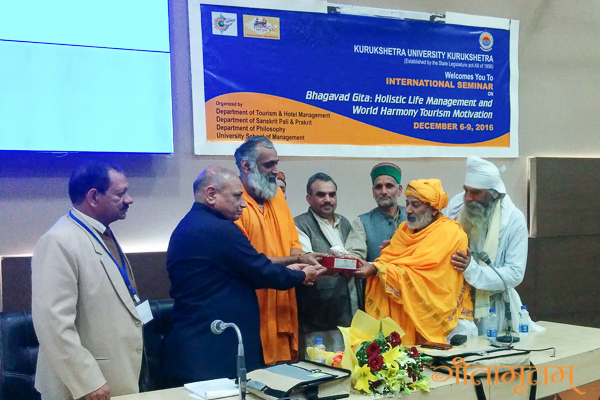 Eight students of Gitamritam will be presenting papers on various topics at the International Seminar. Gitamritam also will have a stall, run various Gita games during the occasion. A number of cultural performances, art shows, literary events and festivities will mark the celebrations up to December 10th. 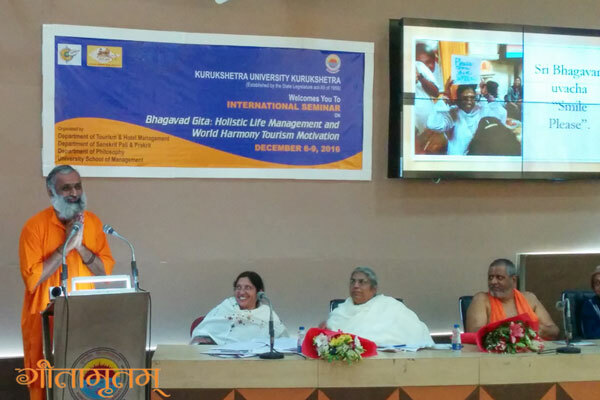 Indian-American astronaut Sunita Williams and US politician Tulsi Gabbard will also speak at the International Seminar on the relevance of Bhagavad Gita in modern life to be held on the campus of Kurukshetra University. 18,000 students from all over Haryana will recite the slokas of the Gita at the inaugural function being held at the sacred Brahma Sarovar in Kurukshetra. During the event, as many as 574 young men and women, each embodying one sloka spoken by Lord Krishna, will converge at Kurukshetra from different cities across the country. Kuruskhetra is in Haryana where Bhagavad Gita was told to Arjuna by Sri Krishna, is 170 KM, just 3.5 hrs away from New Delhi.